This will be a thing for Lunatics decks, but not much else. Also once you opponent is empty-handed he will fully benefit with no drawbacks. 3/5. Once your opponent is empty handed you are probably winning. Or it's late game and you are topdecking too... 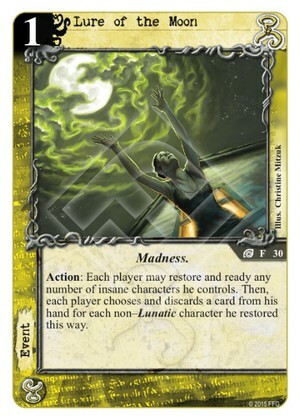 In any event you cannot afford to restore the entire board of your opponent in a deck that relies on insanity like Lunatics. Play it with Artists, and you can benefit from the discard with Quixotic Poet.